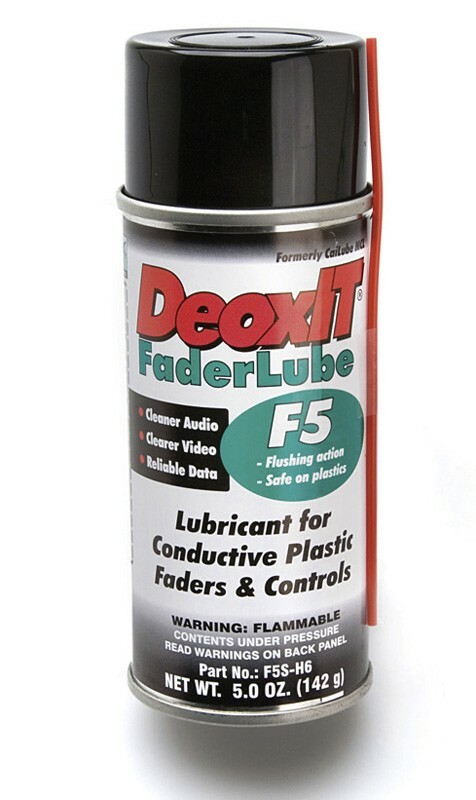 DeoxIT® Fader F-Series is a precision lubricant specifically formulated to improve conductivity and lubricate conductive plastic and carbon compound faders, switches and other similar components. Over time these components lose their original lubrication from wear and/or repeated cleaning. Dust, dirt, drink spills and other contamination also degrade the components' lubricant. The need for re-lubrication is necessary to avoid excess wear and abrasion to the plastic surfaces. Another use for DeoxIT® Fader is on conductive membrane switches and components. Oil, grease and acids build up on the membrane surfaces due to repeated finger contact and can lead to device malfunction. Applying DeoxIT® FaderLube will provide a long-lasting barrier against these types of contamination. The oil, grease and acids will be displaced above the DeoxIT® Fader layer preventing contact with the plastic membrane. Lubrication/protection of plastic-to-plastic parts (faders), plastic-to-metal parts (faders, linear sliders - dot matrix printers), metal-to-metal parts (sliding and slow rotating metal parts, locks, bearings), carbon-based controls (potentiometers) and membrane switches (mouse pointers, touch keypads). There are no demos at this time. Please contact info@keyfax.com for any support issues or questions. Don't see what you are looking for? We'll get it! © 2013 Keyfax NewMedia Inc. All Rights Reserved.